EASY yoga bag, free pattern from Amy Butler Nigella Yoga Bag, I used the new Love Home Dec fabric Trumpet Flowers in Pink. This bag took about 2 hours, it is lined and simple to sew. 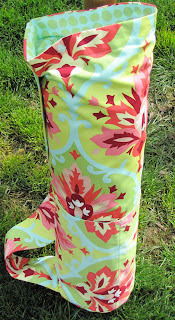 I just wish it was for me :-( But....this fabric will be making a re-appearence, I LOVE IT! I love Amy Butler fabrics too! Very cool.